- Is it possible to improve the visibility of these outputs by adopting open scientific approaches? - Can the quality of these outputs be improved across the research lifecycle by access to advanced Information and Communication Technologies (ICT)? - What specific ICT services are needed by different African Scientific Communities of Practice for their work and how can these be provisioned? 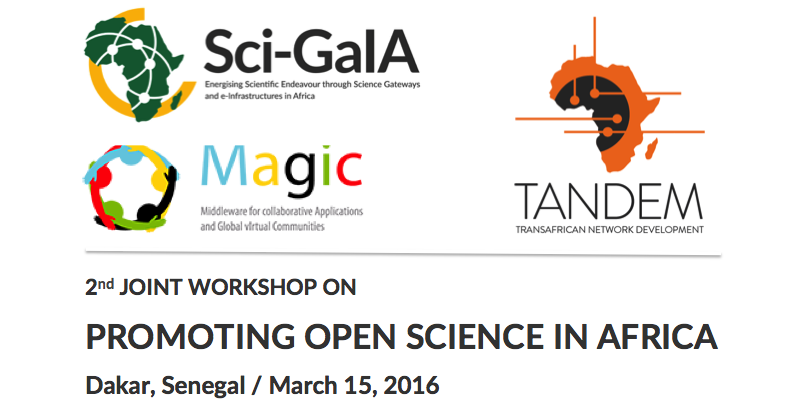 This Workshop presents the opportunity to hear the opinions of leading African Scientists and to see recent advances in Open Science services that have been developed for African Scientific Communities of Practice. The workshop also gives the opportunity to see how e-Infrastructures - such as computing, data and networking infrastructures - as well Science Gateways, Identity Federations, Open Access Data and Document Repositories can be integrated into easy-to-use platforms to support Open Science. It will also bring out the roles that uniqueness and persistence services such as those provided by DataCite and ORCID play in improving research impact and visibility, as well as discuss the key roles that international cooperation projects such as THOR, MAGIC, TANDEM and Sci-GaIA are making to Open Science.